In this second part of our two part series, Sports Broadcast Journal takes you on a journey down memory lane. Dating back to 1888, baseball cards have chronicled the evolution of America’s pastime and played such a memorable element of our childhood. Similar to how listening to old songs can instantly transport us years back to specific moments in time, these cardboard treasures can narrate unending personal memoirs. Over the last several decades, baseball cards have appreciated from bicycle spoke decorations into full-fledged art-like investment assets. Earlier this year, a 1952 Topps Mickey Mantle in gem mint condition sold at auction for $2,880,000. As we all know, however, not all players and cards are created equally. When most of us were ripping open packs of cards, we gravitated to the cards of the elite all-stars and speculated with rookie cards of the highest potential prospects. Years later, as I flip through old sets, it is amazing how many then-popular and less heralded cards now represent today’s top broadcast talent in the game. Today, we shift our focus to the Top 25 all-time announcer baseball cards. In establishing these rankings, we balanced three criteria for each announcer baseball card: (1) Playing Career (2) Announcing Career and (3) Popularity of the baseball card. “Playing Career” is based upon on-field accomplishments and post-season success. “Announcing Career” is based upon durability, popularity, insight, time in position, presence, visibility and respect. “Baseball Card Popularity” is based upon the monetary value of the card, the overall look of the card, any scarcity or nuances of the specific card issue and overall popularity of the card. 25– 1955 Bowman Jerry Coleman – Jerry Coleman rides the strength of his broadcast career to kick off our all-time countdown in the #25 post. He made the most of his playing years in the majors as he captured 4 World Series rings (6 World Series appearances) as the second baseman for one of the great New York Yankees runs. He is also credited with one All-Star season. Coleman is the only MLB player to serve our great nation in two combat tours – World War II and the Korean War. After a meeting with Howard Cosell, Coleman decided to make a run at a broadcast career and he achieved great success with CBS, Yankees, Angels and Padres. 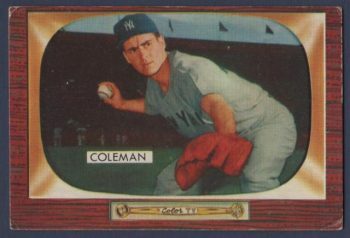 Given Coleman’s mundane playing career, it is no surprise his baseball cards never garnered broad popularity. This 1955 Bowman card is especially difficult to secure in top condition because of the faux-grained wood border that easily shows chips and dings. If you can hunt down a copy in Mint condition, you can probably own the 1955 Bowman Jerry Coleman card for a few hundred dollars. 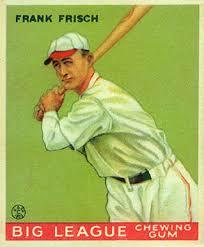 24 –1933 Goudey Frank Frisch – We must travel back to 1933 to find our #24 ranked card. Frank Frisch compiled an impressive Hall of Fame playing career, and even played the dual role of player-manager in 1933 for the Cardinals. The fiery competitor batted .316 for his career – still the highest career batting average for a switch hitter. He added 4 World Series championships as a player (and 1 as a manager), 3 All-Star game appearances and a National League MVP award. After his 16 year managerial run, Frisch was lured into the broadcast business. He had short runs calling games with the Red Sox, Giants and CBS. Frisch’s short tenure in the broadcast booth holds him back from climbing to a higher spot in our rankings. Given the age of this popular 1933 Goudey card, it is no surprise that the highest graded Frisch card received a Near Mint/Mint designation from Professional Sports Authenticators (PSA). There are 11 cards with that grade and the highest of the group sold for $5,520 in 2017. 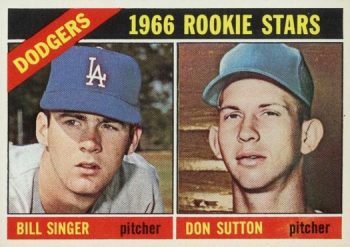 23 –1966 Topps Don Sutton – Don Sutton has been a paragon of consistency and longevity. The HOFer accumulated 324 wins and 3,574 strikeouts in his 23 seasons. In addition, Sutton has been a staple in the broadcast booth since 1989 – and he’s still going. While baseball card investors often assign more value to players who are elite players in the game for a shorter period of time than they do for players like Sutton who achieve consistency and longevity, Sutton’s rookie card has amazingly reached a final hammer price of more than $10,000 for 1 of the 4 “Gem Mint” copies. The 21 year-old Sutton shares his rookie card with fellow prospect Bill Singer. If you look closely at Sutton’s cap, you will notice that Topps had not yet mastered Photoshop technology so it essentially paints a blue, logo-less cap on Sutton in lieu of an actual photo in his Dodgers uniform. 22 – 1948 Leaf Lou Boudreau – The versatile Lou Boudreau finds his way into our #22 ranking. The Hall of Famer achieved rare success in baseball as a player, manager and broadcaster. In his 15 years as a player, Boudreau reached the All-Star game 8 times, won a World Series championship, bagged an American League MVP Award and won a batting championship. He then tacked on 16 years as a manager, and lays claim to a patent on the infield shift as he was the first to deploy this now more common technique against the pull-hitting Ted Williams. Beginning in 1958, Boudreau established himself as the recognizable voice of Chicago sports as he called Cubs games through 1987, and even dabbled calling some Chicago Bulls games. 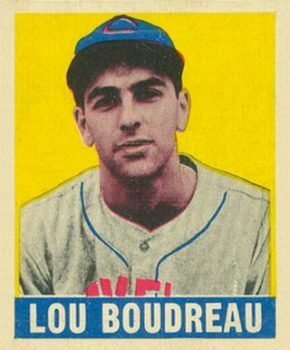 Although not his rookie card, Lou Boudreau’s most valuable card is featured in the especially popular and elusive 1948 Leaf set. This colorful Boudreau card reached a $7,500 sale price in 2014 for a Mint version. 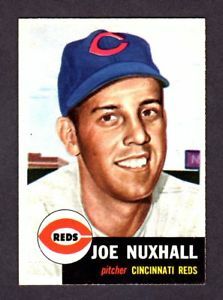 21 – 1953 Topps Joe Nuxhall – The precocious Joe Nuxhall secures the #21 ranking. Cincinnati Reds fans aligned themselves with Nuxhall for more than half of a century. In 1944, with World War II taking a toll on MLB rosters, Nuxhall became the youngest player ever to play in a MLB game when he pitched before his 16th birthday. He made it back up to the big leagues for good in 1952 and played another 15 seasons. With 2 All-Star game appearances, 135 wins and 1,372 strikeouts, Nuxhall was solid. The dependable Nuxhall logged 40 years in the Reds broadcast booth with his beloved signature phrases, including “this is the old left-hander, rounding third and heading for home.” Nuxhall debuted on a baseball card in 1953 when Topps featured him in their second season of producing these cardboard treasures. This smiling Nuxhall portrait will cost you more than $2,000 in Mint condition. 20– 1956 Topps Herb Score – Herb Scores powers his way into our #20 post. As a player, Score put up 55 wins, 837 strikeouts and 2 All-Star game appearances in his 8-year playing career. 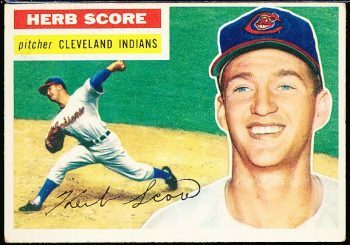 He wasted no time making an impact for the Cleveland Indians as he won the American League Rookie of the Year Award in 1955, and even made it onto the cover of Sports illustrated as a rookie. Score’s career was impacted, and eventually cut short when he took a scorching line drive off the bat of Gil McDougald to the face. In 1964, he launched his 34-year broadcast career known for his low voice and low-key style. He ended his announcing days on a high as his last game called was game 7 of the 1997 World Series. Score’s 1956 Topps beautiful rookie card combines an in-action illustration with a close-up portrait. Despite Score’s short playing career, this card still sells for nearly $1,500 in Mint condition. 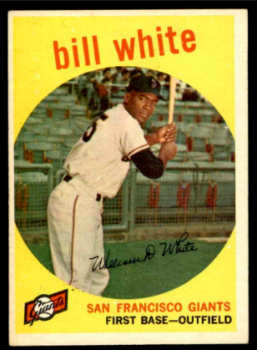 19 – 1959 Topps Bill White – In addition to his pioneer status in the broadcast booth and league offices, Bill White also takes home the #19 seat in our rankings. The lovable White achieved on and off the field. His 13-year playing career was highlighted by 8 All-Star game appearances, 7 Gold Glove awards, a World Series championship and 202 career home runs. White saw his path to the radio booth open up as an active player when he hosted his own show on KMOX in St. Louis. Upon retirement, White called some hockey games for the Philadelphia Flyers and eventually found his way to the Big Apple where he became the play-by-play voice for the New York Yankees and started his partnership with Phil Rizzuto. White was the first African-American to do play-by-play regularly in MLB. In 1989, he walked away from his successful broadcast career to become President of the National League – becoming the first African American to hold such a leadership position in any American sport. Despite White’s popularity and accomplishments, his baseball cards seemingly underperform monetarily. His 1959 Topps rookie card is obtainable in Mint condition for just a few hundred dollars. 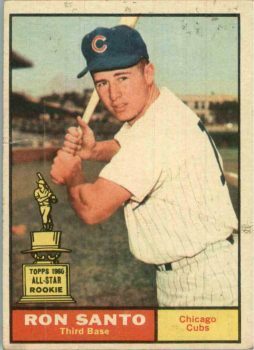 18 – 1961 Topps Ron Santo – The “single biggest Cubs fan of all-time” locks down the #18 spot. As a player, Ron Santo put together 9 All-Star seasons, 342 home runs, 1,331 RBIs and 5 Gold Glove Awards. The HOF third baseman played 14 of his 15 seasons with the Cubs. He also has the unique distinction of being the first player to exercise MLB’s then trade veto clause for players with more than 10 years of overall service (and the last 5 or more with the same team) – he declined a trade to the California Angels, and eventually settled for a trade to the crosstown White Sox. In 1990, Santo joined the radio booth for Cubs games on WGN where he flourished until his death in 2010. He teamed with famed partners such as Harry Caray, Steve Stone and Thom Brennaman. Santo even dabbled in the football broadcast world with the Bears and Packers. Santo’s 1961 Topps rookie card features the popular All-Star rookie trophy. 13 copies of this high demand card have earned the PSA Gem Mint grade with a record sales price of $11,300 in 2013. 17– 1949 Bowman George Kell – The easy-going George Kell strolls into the #17 slot in our all-time rankings. Kell represents a strong balance of on-field and broadcast booth success. As a Hall of Fame player, Kell put together 15 solid season with 5 different teams. Kell maintained a .306 lifetime batting average and reached the All-Star game 10 times. He is the man who stood between Ted Williams and a 3rd Triple Crown award in 1949 as Kell edged out Williams’ batting average in the final week of the season. Following his playing days, Kell put together a 37-year, stellar broadcast with CBS, ABC and the Detroit Tigers. This 1949 Bowman George Kell rookie card is part of a series that combined black and white player photos with the addition of illustrated uniform colors added. Only 3 Kell rookie cards have achieved the elusive Mint grade from PSA, and one of those sold for $6,863 back in 2006. 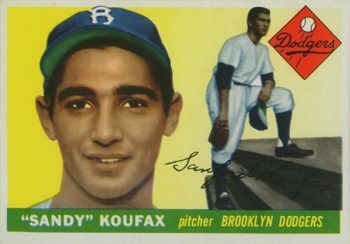 16 – 1955 Topps Sandy Koufax – Sandy Koufax carves out the #16 spot in our rankings – and this ranking is sure to polarize with those prioritizing playing career pushing for a more elite ranking, and the announcer purists questioning Koufax’s inclusion on the list. Although Koufax injury-shortened career lasted only 12 years, he amassed a colossal fan following, won 3 Cy Young Awards, a National League MVP award, 4 World Series championships, 3 Pitching Triple Crowns and pitched 4 no-hitters. From 1961 to 1966, Koufax dominated opposing hitters in a way perhaps never seen in the game. Playing his games in Brooklyn and Los Angeles only added to his fan following. He is the youngest player ever to be elected to the Baseball Hall of Fame. Following his retirement at 30 years old, Koufax signed a 10-year, $1 Million contract to announce for NBC. After six years of broadcast work with mixed reviews, he quit and walked away from announcing. Like his playing career, Koufax’s baseball cards rival the most elite cards ever made in popularity. This 1955 Topps rookie card is an absolute industry icon – in 2016, a MINT graded copy of the card sold for $215,100. 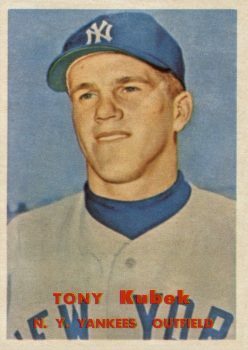 15– 1957 Topps Tony Kubek – The outspoken Tony Kubek nails down the #15 all-time ranking. He burst onto the MLB scene by winning the American League Rookie of the Year Award in 1957. He also put together 4 All-Star seasons. As a member of some of the greatest New York Yankees teams of all-time, he played in the World Series in 6 of his 9 seasons – with 3 championship rings to his name. During his 24 years calling games for NBC, Kubek provided the soundtrack for some of the most memorable moments in MLB history, including Hank Aaron’s 715th home run. He teamed with Jim Simpson, Bob Costas, Joe Garagiola and Curt Gowdy. He subsequently called local games for the Blue Jays and Yankees. Although Topps began to deploy photography into its cards for the first time in 1957, Topps had to leverage some artwork to feature Kubek in a Yankees uniform for this rookie issue. In top condition, the Kubek rookie should run you about $1,000. 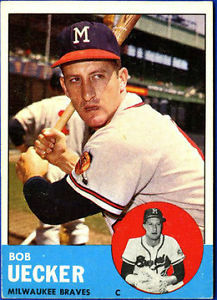 14 – 1963 Topps Bob Uecker – Dubbed “Mr. Baseball” by Johnny Carson, Bob Uecker checks in at #14 in our all-time rankings. While his 6 year playing career with a lifetime .200 batting average and 14 career home runs can be generously categorized as “below average”, Uecker did manage to win a World Series championship. Uecker’s humor paved the way for a Hollywood career highlighted by iconic Miller Lite commercials, a starring role in the sitcom Mr. Belvedere and a memorable role in the big screen hit Major League. Uecker’s accomplished broadcasting career gained him the much deserved 2003 Ford C. Frick Award from the National Baseball Hall of Fame as the broadcaster making “major contributions to baseball.” Despite limited success on the diamond during his playing days, Uecker’s personality and popularity fueled much interest in his baseball cards. This 1963 Topps rookie card has sold for as much as $1,000 – perhaps giving Uecker one of the greatest card value to career home run ratios ever for non-pitchers. 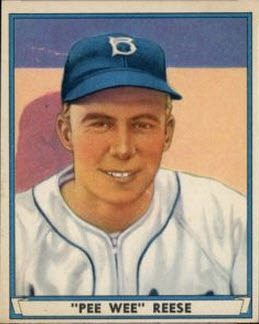 13 – 1949 Bowman Richie Ashburn – The beloved Philadelphia sports icon and Hall of Famer earns our #13 all-time ranking. 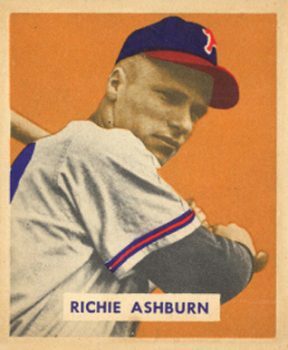 Although Richie Ashburn only hit 29 home runs in his 15 playing seasons, he is the proud holder of 2 National League batting championships and a lifetime .308 batting average. The 6 time All-Star also has one stolen base title to his credit. Ashburn began his broadcast career with the Phillies in 1963 and continued as a fan favorite in the booth until the time of his death in 1997. Ashburn and Harry Kalas formed one of the greatest local broadcast teams over their decades together. A very serious looking Richie Ashburn illustration highlights this 1949 Bowman rookie card – a card that will set you back nearly $10,000 in Mint condition. 12 – 1941 Play Ball Pee Wee Reese – The Brooklyn Dodger all-time great secures our #12 ranking with strong grades in all three of our criteria. Over the course of his 16-year playing career, with a 3-year military interruption, Reese chalked up 10 All-star game appearances, 2 World Series Championships, 126 home runs and 885 RBIs. In addition, the beloved Reese garnered much acclaim for his support and defense of Jackie Robinson as he was breaking the race barrier in baseball. The Hall of Famer and captain of some of the great Brooklyn Dodgers teams transitioned to the broadcast booth in 1960 as he teamed with Dizzy Dean for the CBS Game of the Week. He later achieved much broadcast acclaim for his work with NBC alongside Curt Gowdy. Gum, Inc. featured Reese’s rookie card in its 1941 Play Ball issue. Even beyond the normal issues with cards of this age, the Reese rookie is especially difficult to find in elite condition. Only 2 copies of this card have ever achieved a Mint designation from PSA – and neither has ever hit the public sale block. A Mint Pee Wee Reese rookie should comfortably fetch north of $30,000. 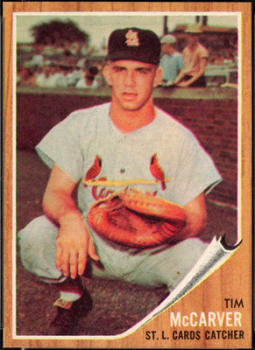 11 -1962 Topps Tim McCarver – Although Tim McCarver is still going strong in the broadcast booth, he checks in at the #11 all-time ranking. Not only is he one of the greatest color commentators ever to put on a headset, but he also compiled a 21-year career featuring two World Series championships and two All-Star game appearances. While his seasonal offensive statistics may have been deemed slightly above average, McCarver served as the backstop for an incredible 121 shutouts. The 1962 Topps Tim McCarver rookie card presents many challenges in terms of finding the card in elite condition – in fact, only one card has ever received the “Gem Mint” designation from PSA. 1962 Topps cards are notoriously associated with damaged printing plates, poor quality control and easy border chipping/corner damage because of the issues wood grain borders. The lone “Gem Mint” McCarver rookie card last publicly sold in 2012 for $2,257. If that card were to hit the market today, it would undoubtedly fetch five figures. 10. 1965 Topps Joe Morgan – In addition to ranking as one of the greatest second basemen the game has ever seen, Joe Morgan can also take pride in reaching #10 in our all-time rankings. Over his 22-year, hall of fame career, the clutch-hitting Morgan played for six teams and accumulated 268 home runs and 689 stolen bases. As a cornerstone for the Big Red Machine, he won back-to-back National League MVP awards in 1975 and 1976, made 10 All-Star game appearance, won 5 Gold Glove awards and owns two World Series championship rings. He launched his accomplished broadcast career with the Reds in 1985 and subsequently starred in high-profile national broadcast roles with ABC, NBC and ESPN – teaming with Bob Costas, Bob Uecker, Greg Gumbel, Jon Miller and Orel Hershiser. Morgan was also an esports visionary as he was featured as the voice of MLB2K video game. 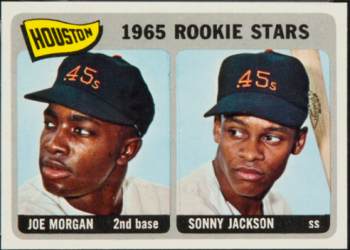 He debuted on this 1965 Topps baseball card with fellow rookie Sonny Jackson in their Houston Colt .45 uniforms. The card is often found in off-centered condition. A Gem Mint (and perfectly centered) version of the card sold for more than $10,000 in 2014. 9 – 1948 Leaf Ralph Kiner – The inaugural member of the New York Mets broadcast booth achieves our #9 designation. 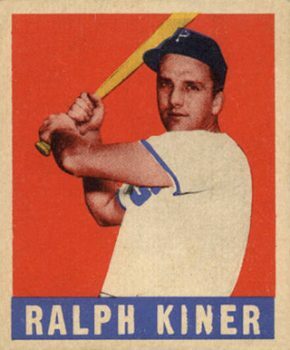 Although injuries cut Ralph Kiner’s hall of fame playing career to only 10 years, the slugger’s torrid home run pace still landed him at 369 career home runs. He led the National League in home runs in 7 consecutive seasons. He famously said, “Home Run hitters drive Cadillacs and singles hitters drive Fords.” As a broadcaster, Kiner began working games for the Chicago White Sox, and after one season was recruited to New York to call games for the new expansion team. He held down that role until the time of his death in 2014 – an amazing 53 year announcing run!!! The host of Kiner’s Korner first appeared on a baseball with this 1948 Leaf issue. The colorfully illustrated card has generated a nice following and reached a record sale price of nearly $11,000. 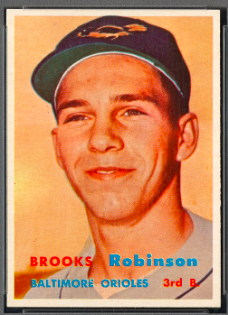 8 – 1957 Topps Brooks Robinson – Arguably the greatest defensive third basemen of all-time, Brooks Robinson’s rookie card holds down the #8 ranking. Over his 23-year playing career, he assembled an incredible 18 consecutive All-Star game appearances and 16 Gold Glove Awards. Robinson also claimed the American League MVP Award in 1964, and won World Series MVP in one his two champions seasons. Following his Hall of Fame playing career, Robinson took residence in the Orioles broadcast booth where served as one of the best in the business. As you would expect from a player of Robinson’s on-field success and popularity, his baseball cards are immensely popular. This 1957 Topps rookie card features a smiling Arkansas native about to become one of Baltimore’s favorite sons. A Gem Mint copy of this cards sold for a record $47,251 in 2012. 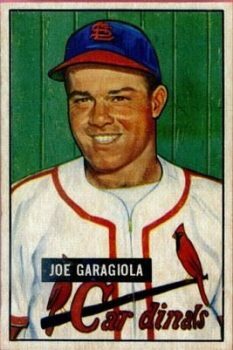 7 – 1951 Bowman Joe Garagiola – While an argument can be made that Joe Garagiola was the greatest baseball announcer of all-time, Garagiola’s pedestrian playing career knocks him down to the #7 post in our rankings. His 9-year playing career spanned 4 teams, featured a World Series championship with the Cardinals in 1946, and 42 career home runs. The World War II veteran later joked that he remarkably managed to get traded to 4 different teams at a time when there were only 8 teams. The season after his retirement, Garagiola launched his broadcast career in the radio booth for the Cardinals. He later created baseball memories for so many of us as the voice for NBC baseball for 30 years, mastering both play-by-play and color commentary. His broadcast partners form a “who’s who” announcer list with George Kell, Curt Gowdy, Vin Scully and Tony Kubek. Garagiola even had a 4-year run with NBC’s Today Show from 1969-1973. 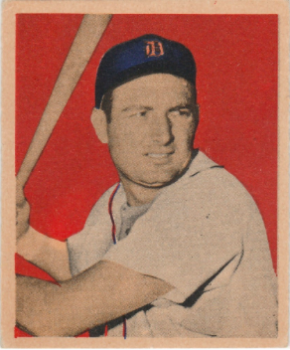 Although Garagiola began his playing career in 1946, he had to wait until 1951 to be featured on his own baseball card. Despite his storied broadcast career, Garagiola baseball cards have only achieved modest popularity. You can likely steal his 1951 Bowman rookie card in Mint condition for a very reasonable $1,000. 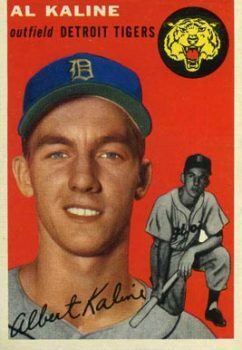 6– 1954 Topps Al Kaline – First ballot Hall of Famer Al Kaline comfortable gains Top Ten status with the #6 ranking. It is hard to imagine Detroit Tigers baseball without some association to the well-rounded Kaline. He spent his entire 22-year playing career in Detroit and then followed those years with another 28 years in the Tigers broadcast booth. Mr. Tiger put together 18 All-Star seasons, a World Series championship, 10 Gold Glove Awards, a batting championship, 399 home runs, 1,583 RBIs and a .297 lifetime batting average. In 1971, Kaline remarkably turned down a pay raise from the Tigers as he did not feel his past season performance justified it. After retiring, Kaline joined the Tigers television broadcasts – he held onto that announcer role until 2002. In the baseball card world, Kaline finds himself firmly positioned in the second tranche of 1950s rookie cards behind icons such as Mantle, Aaron, Mays, Clemente and Koufax. The popular Kaline rookie card has only graded out by PSA in Gem Mint condition once. That perfect encapsulation of Kaline sold for $88,688 in 2012. 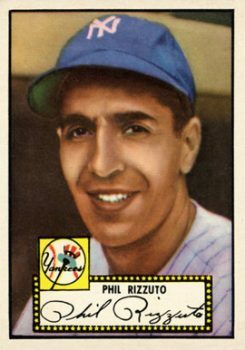 5 –1952 Topps Phil Rizzuto – The beloved Yankee great Phil Rizzuto scoots into the #5 all-time position. He was undeniably a fan favorite on one of the great sports dynasty teams of all-time – he won an amazing 7 World Series championships in his 13-year playing career. He also had a 3-year career interruption for his service in World War II. Although Rizzuto was more known for his defensive prowess, he took home the American League MVP award with an offensive surge in 1950. The 5 time all-star was voted into the Hall of Fame 38 years after retiring his shortstop position for the Bronx Bombers. Over his 40 year broadcast career, the ever-popular Rizzuto became synonymous with Yankees baseball. In addition to great insights into to the game, fans could always count on more than a few trademark “holy cows” and great reliability in delivering birthday wishes. Although this 1952 Topps card is not Rizzuto’s rookie card, it holds the distinction of being his most valuable card as it benefits from the rarity and popularity of Topps first ever issue. 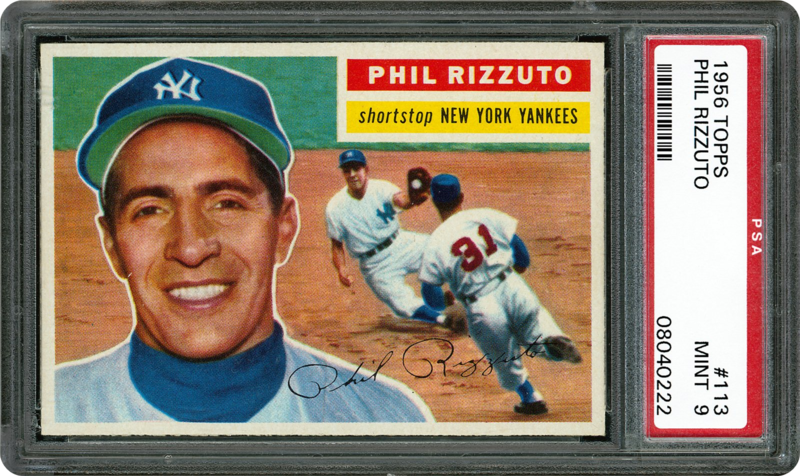 Only two copies of the 1952 Topps Rizzuto have ever achieved a Mint grade from PSA – and neither has ever made it ways to the public sale block. If one of the two owners ever decided to sell, the cards would surely return five figures. 4 –1966 Topps Jim Palmer – As our highest ranking active announcer, Jim Palmer lands in the #4 spot. As a first-ballot Hall of Fame pitcher, a 5 decade elite color commentator and the subject of a premium investment rookie card, Palmer crushes all of our criteria. He amassed an incredible 3 American League Cy Young Awards owns 3 World Series championship rings. Palmer begin his broadcasting career as an active player when ABC featured him as color commentator for the 1978 American League playoffs. He even garnered additional fanfare as a model for Jockeys. The 1966 Topps issue captures a boyish-looking Jim Palmer embarking on stardom. 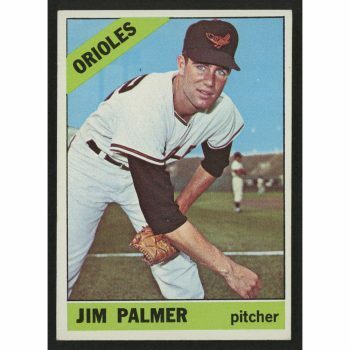 Amazingly, no 1966 Topps Jim Palmer has ever achieved the “Gem Mint” designation from PSA. So, collectors and investors are left to bid for one of the 77 cards grading out at “Mint” – expect to pay a few thousand dollars. 3 –1967 Topps Tom Seaver – Tom Terrific puts a firm hold on the #3 slot in our countdown. Seaver certainly finds his way on any list of the greatest pitchers of all-time with 311 career wins, a lifetime 2.86 ERA, 3,640 strikeouts, 12 all-star game appearances, 3 Cy Young awards, a Rookie of the Year award and a World Series championship. He played for 4 different teams in his 20 year career and achieved the second highest percentage of Hall of Fame induction votes – second only to Ken Griffey, Jr. Seaver began his broadcast career as an active player when he worked the 1977 World Series for ABC. He later worked with the Mets, Yankees and stepped into Joe Garagiola’s national NBC role opposite Vin Scully. 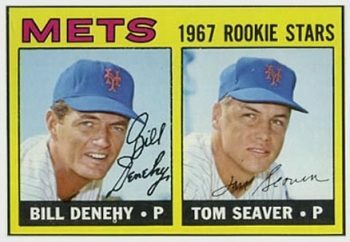 Seaver shares this popular 1967 Topps rookie card with Bill Denehy. It is safe to say that Seaver was the driver of the $24,450 sale price for a Gem Mint copy of this card back in 2012. 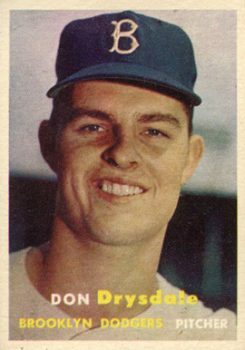 2 –1957 Topps Don Drysdale – Not only was Don Drysdale one of the most dominating pitchers of his generation, but he also accomplished an elite and versatile broadcasting career – and we reward Drysdale with the #2 all-time ranking. Standing a towering 6 feet and 5 inches, the intimidating Drysdale mastered the brushback pitch, and together with Sandy Koufax, formed perhaps the greatest pitching duo of all-time. In his 14-year, injury-shortened career, Drysdale compiled 209 wins, 2,486 strikeouts, a lifetime 2.95 ERA, 9 all-star game appearances, 3 World Series championships and a Cy Young award. Drysdale was a staple in the broadcast booth from 1970 up until his sudden death in 1993 at the young age of 56. He pushed well beyond the expected baseball color commentary role as he excelled in a football play-by-play role and also ABC’s Wide World of Sports and The Superstars. Drysdale was a guest star on many of the most popular tv shows of his day – he personally won me over with his Brady Bunch appearance. As for the baseball card world, Drysdale’s 1957 issue is an incredibly popular issue for a number of reasons, including that it was the first issue where Topps used actual photos instead of artwork, and it was the last issue featuring the Brooklyn Dodgers. In 2016, this Drysdale rookie card achieved a record auction price of $39,600. 1 – 1933 Goudey Dizzy Dean – We must set our calendars back 85 years to find our top ranking announcer card of all-time. The colorful Hall of Fame pitcher excited fans of the legendary Gashouse Gang with both his on-field prowess and his trash-talking that would be more expected from a player in today’s generation. 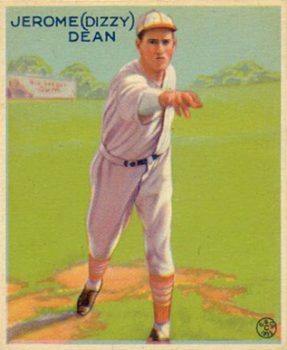 In 1934, Dean won the National League MVP award as the last 30-game winner in the National League and led his St. Louis Cardinals to the World Series championship. His 17 year playing career included 4 all-star game appearances, 150 wins and a lifetime 3.02 ERA. Immediately following an injury shortened career, the popular Dean was recruited into the broadcast booth where he played up his country boy roots and mocked himself as short on brain power. Fans loved his wit and self deprecating humor. He starred in the broadcast booth for 25 years with the Cardinals, Browns, Yankees, Braves, and then national broadcasts for Mutual, ABC and CBS. The 1933 Goudey issue is in incredible demand as the colorful and artistic illustrations were groundbreaking compared to previous card issues. One of the two Dizzy Dean submissions to ever grade-out in Mint condition by PSA achieved a final hammer price of $31,200 in a public auction in September 2017.